In their paper, published in Nature Physics, the group led by Professor Jukka Pekola presents a way to solve a problem regarding how quantum systems interact and exchange energy with their macroscopic surroundings, and within themselves. The group strives to treat quantum information and thermodynamics on the same footing in their research. "We have realised a miniature heat valve in a quantum system composed of an artificial atom, a superconducting qubit—the basic building block of both quantum computing and quantum heat engines," explains Professor Pekola. In quantum computers, the qubit has to be decoupled from the noisy external world to sustain a fragile quantum state, but in quantum heat engines, the system needs to be coupled to its dissipative surroundings in the form of heat baths. 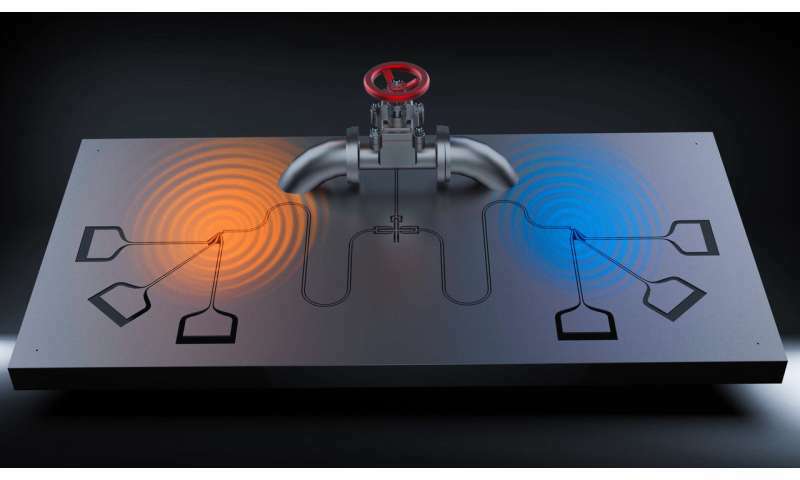 A particularly puzzling problem is the process of thermalisation when connecting external heat sources or 'thermal baths' to a coherent quantum system or qubit. Ultimately, heat is exchanged between these systems through the emission of photons. "Using a qubit controlled by a magnetic field as a valve, we can either block or release the flow of photons carrying the heat through the qubit between two heat baths formed of metallic resistors," explains Dr. Alberto Ronzani, the lead author of the paper. A quantum heat engine transforms heat into useful work or, in reverse, operates as a refrigerator. "Our work demonstrates how a heat valve can work in certain cases. We aim to understand, combining experimental and theoretical efforts, how quantum refrigerators and heat engines work, but have yet to come up with a general picture of the cross-over between non-dissipative and fully dissipative systems. That's a challenge for the future," says Pekola. What is the purpose of this device?